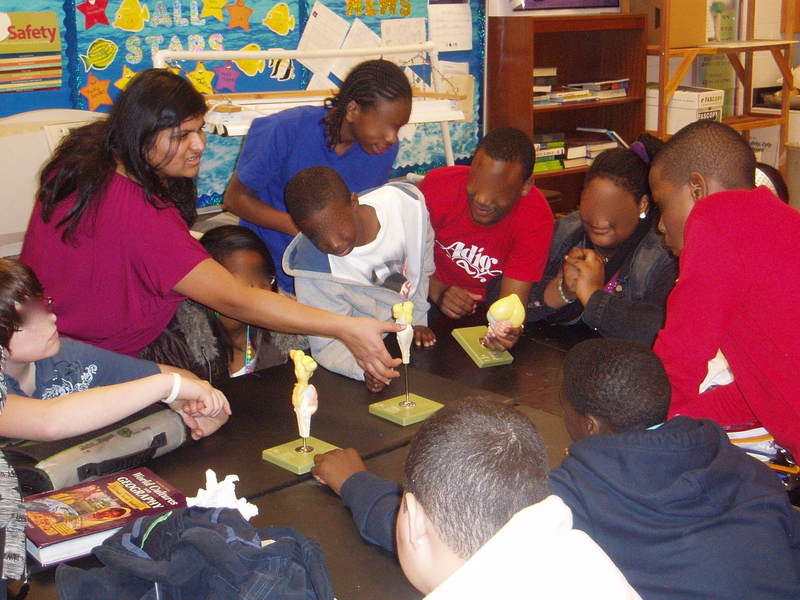 I have participated–as an organizer, leader, and volunteer–in a wide variety of STEM public engagement initiatives, especially with K-12 students. I strive to inspire enthusiasm for science and the natural world and trust in scientists by leading hands-on science activities and sharing my ongoing research. The opportunity to interact personally with a scientist can also dispel stereotyped concepts of who is (and can become) a scientist and what we actually do day-to-day. Engaging with the public enhances the quality and impact of my research and teaching, and I have integrated it directly into my research program. View all of my public engagement activities here. Check out our public engagement poster “Professional development through evidence-based public engagement”, a comprehensive look at our approach to STEM engagement and ‘how to’ recommendations. Host, Summer 2016 & 2017.The Shadow a Scientist program pairs middle school students with a scientist at the University of Texas at Austin. The students get to observe first hand what it is like to be a scientist in a research area of their interest! The program is run by Dr. Greg Clark. Find out more on the Shadow a Scientist website. Speaker, March 13, 2016. Nerd Nite hosts speakers who are experts on themes of all kinds. During a special SXSW Brain Games edition of Nerd Nite, in collaboration with National Geographic, I explored the world of animal behavior research to uncover the biological basis of social behavior and its consequences. Learn more about Nerd Nite Austin or find a Nerd Nite in your hometown! Speaker, Volunteer 2015. Science Under the Stars is a free, monthly science lecture series for the public. It was founded and organized by graduate students in the Department of Integrative Biology at University of Texas at Austin. Since 2009, SUTS has hosted over 30 speakers! I spoke to members of the public and the UT community on March 12, 2015. Find out more on the SUTS website. Featured guest, They Blinded Me with Science is a radio show on KVRX 97.1, the student-run radio station of University of Texas at Austin. DJs Ganglion, R Nought, and Chrysalis host science news and speakers once a week, Mondays at 8:30 pm. Listen to my interview on March 9, 2015! Co-Organizer 2010-2013; volunteer 2009-2014. This year-round initiative matches volunteers (students, faculty, and staff) from Atlanta Universities/Colleges, including Georgia State University, Emory University, Georgia Tech, Morehouse College, Agnes Scott College, and Spelman College, with K-12 educators. 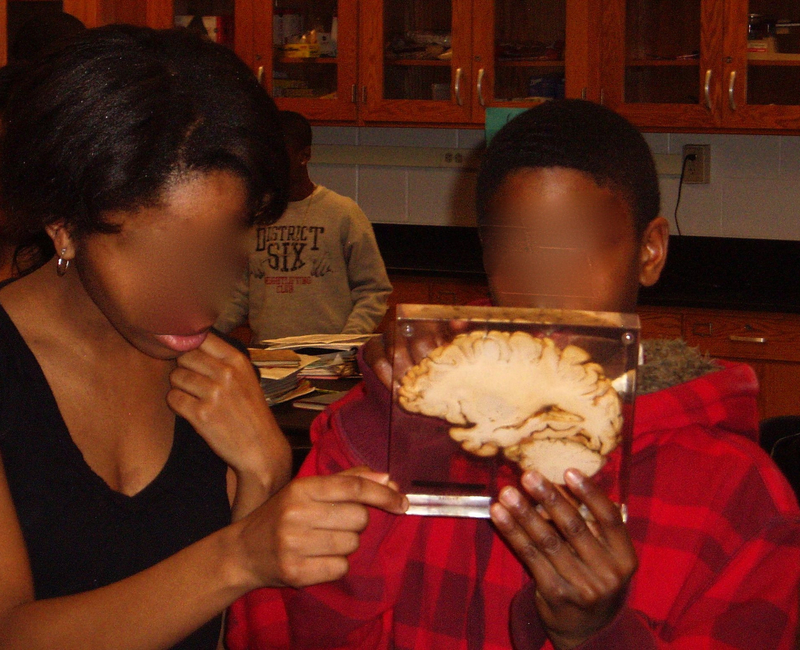 Many of the elementary, middle, and high schools serve students underrepresented in science. Volunteers lead activities about neuroscience, share ongoing research, and advocate for careers in science. Volunteers are often requested by the same schools and teachers, year after year! I personally visited 37 schools and ~2,250 students. I also organized Georgia State and ACSfN volunteers for the Fernbank Museum of Natural History’s Science at Hand Day (2011-2013). More than 1,200 people visit the museum every year for this great community science event! 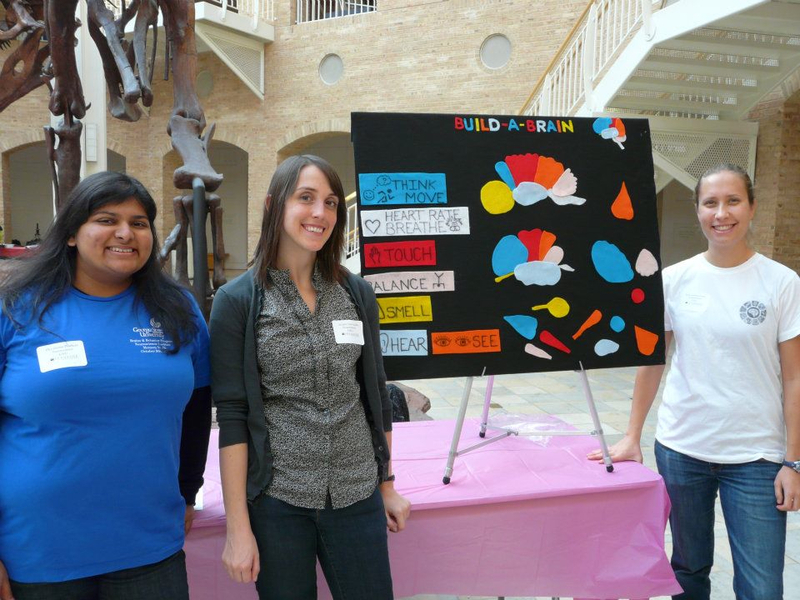 Devaleena Pradhan, Ariana Tamvacakis, and me (left to right) at the Fernbank Museum of Natural History’s Science at Hand Day. 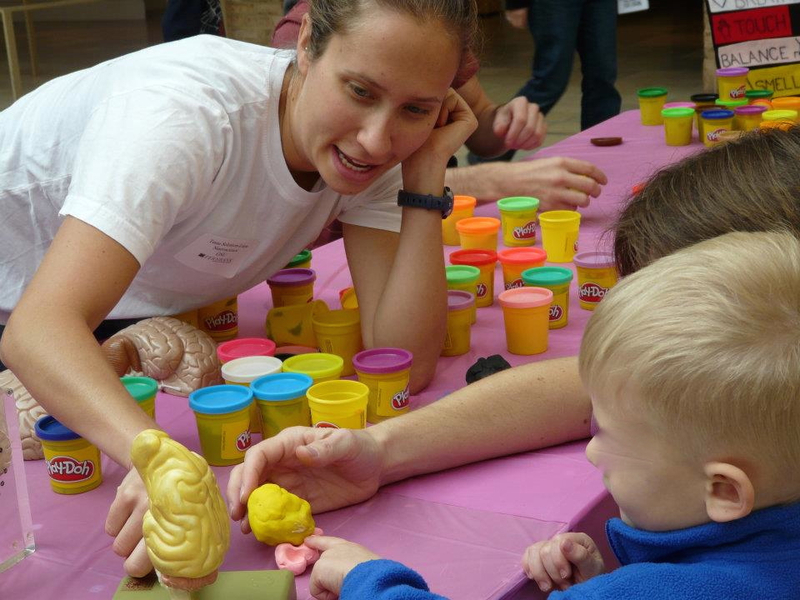 Using Play-Doh to “build-a-brain” at Science at Hand Day. Over 1,200 visitors attend this event annually! 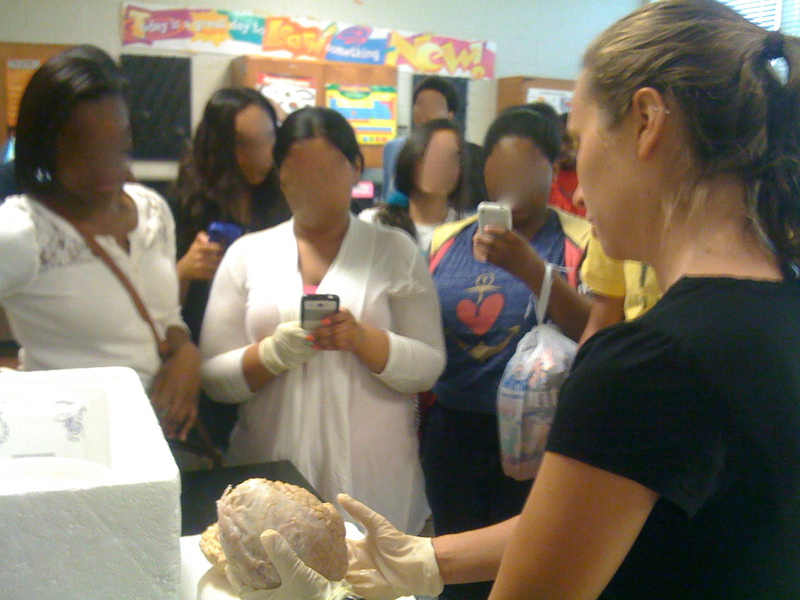 Touch-a-Brain: High school students taking pictures of a real human brain I am holding. They have the opportunity to examine it up close and even touch it! I worked with Chair Dr. Anne Murphy and a team of Georgia State University graduate students to organize and run the 2013 annual meeting of the Society for Behavioral Neuroendocrinology (Program Book). 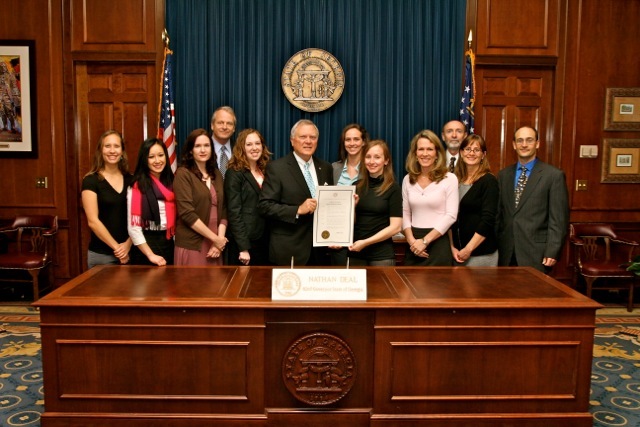 Georgia State University organizing committee for the 2013 annual meeting of the Society for Behavioral Neuroendocrinology. Front row (l-r): Joe Terranova, Katharine McCann, Elizabeth Jeffress, Leslie Dunham, me, Hillary Doyle. 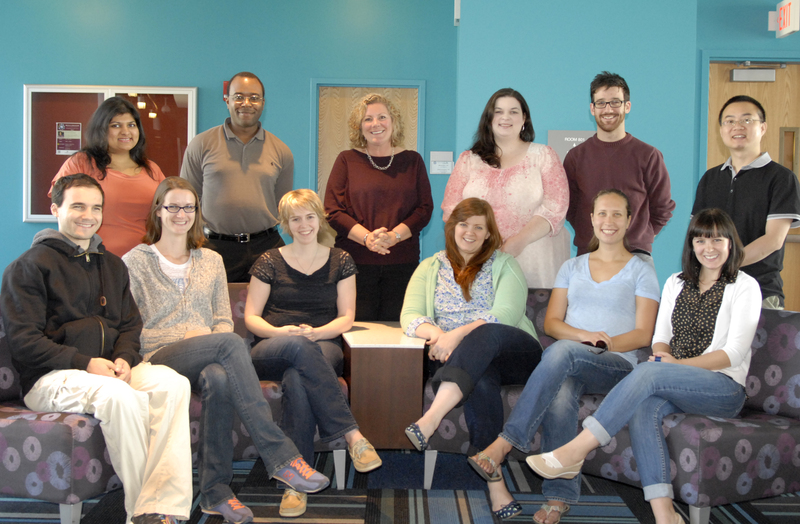 Back row (l-r): Devaleena Pradhan, Christopher Fields, Anne Murphy, Jenna Darling, Johnny Garretson, Eric Song. Not pictured: Marisa Levy. 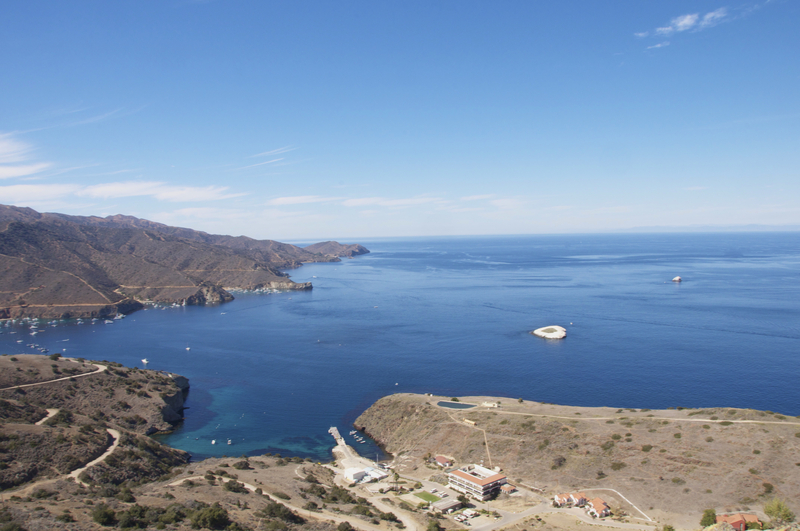 The University of Southern California’s Wrigley Institute for Environmental Studies (Big Fisherman Cove, Catalina Island, CA).